St Valentine’s Day isn’t traditionally a day for a party, but it is a day for giving. 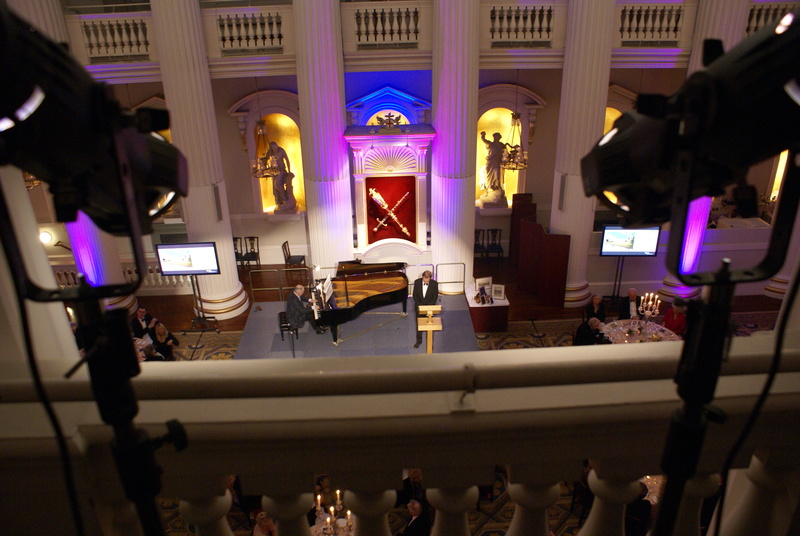 Last Wednesday we hosted a sumptuous event at the Mansion House, kick-starting our fundraising campaign to create a permanent home for CMF in the City of London. Naturally the evening was full of music, as well as fine food and drink, and we made full use of what is a truly palatial house. After cocktails in the Salon, our guests were whisked upstairs to the Old Ballroom for the first musical entertainment of the evening, Mendelssohn’s fizzing Octet. Written for two string quartets, this piece always provides an opportunity for artistic collaboration and sharing, and for this performance CMF Artists the Gildas Quartet and Michael Foyle teamed up with three members of the world-renowned Brodsky Quartet, who are CMF patrons. The majority of the evening was spent in the Egyptian Hall, where a delicious 5-course meal was served, as well as more music between courses! The first turn came from our special guest, Hugh Laurie, who played the narrator in Poulenc’s The Story of Babar the Little Elephant, accompanied by celebrated pianist and CMF patron, Iain Burnside. After dessert, Michael Foyle took to the stage again to offer a few musical bonbons with Iain Burnside. They performed Elgar’s Salut d’Amour and Kreisler’s Liebeslied, between which Michael spoke about how much CMF has improved his life and work as a musician. Once the meal had finished, CMF trustee and Managing Director of the Barbican, Sir Nicholas Kenyon, gave a short speech outlining our plans for a permanent home in the City of London. With the generous support of Gensler, CMF will soon begin developing St Bartholomew the Less, a beautiful, 16th-century octagonal church within the grounds of St Bartholomew’s Hospital. This church will become CMF’s home and so the main venue for our work, be it workshops, recordings, rehearsals, or concerts, all the while engaging with the local hospital community. Sir Nicholas’s speech put this development in the context of the wider changes occurring within the public realm in the North-West quarter of the City of London, including the formation of Culture Mile, of which the church will be a part. The final item in the Egyptian Hall was an auction, which was run by Giorgia Parodi Brown from Sotheby’s. Twelve lots were sold in total, including three Silver Picture Frames made by Grant Macdonald, two etchings by Norman Ackroyd RA, two tickets to the Last Night of the Proms, and a commission from 2014 CMF Artist Misha Mullov-Abbado. After the Loyal Toast, the doors to the Salon were flung open and the Kansas Smitty’s House Band played the remaining revelers into the night, dancing all the way. There was much talk of repeating this event in 2019, so watch this space!